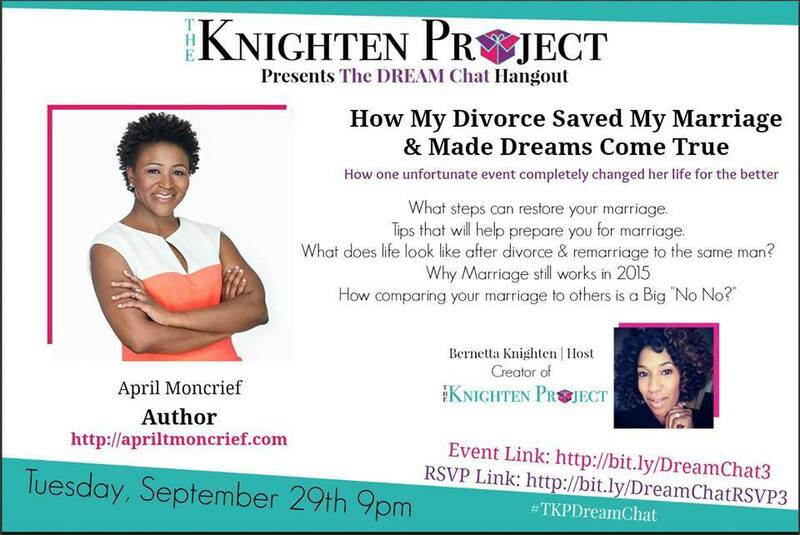 April Moncrief, Author of How My Divorce Saved My Marriage, Featured Guest on The Dream Chat, The Knighten Project! JOIN US IN THE DREAM CHAT HANGOUT, TUESDAY, SEPTEMMBER 29th,@ 9pm! The Knighten Project! Okay everybody, Get Geady! I’m teaming up with The Knighten Project, and we’ll be discussing my latest book, “How My Divorce Saved My Marriage”. The Knighten Project is an amazing organization that focuses on inspiring Hope in everyday people by helping to facilitate their biggest dreams! So on Tuesday, September 29, 2015 @ 9pm, you’re invited to the Dream Chat hangout to hangout with myself and the founder of The Knighten Project, Bernetta Jackson-Knighten! We’ll be discussing the struggles and strategies I used in my marriage to turn it into, not only a dream marriage, but now a dream career for me! Hope to see/hear you there! By the way, the link to sign up/register for the Dream Chat is right here! 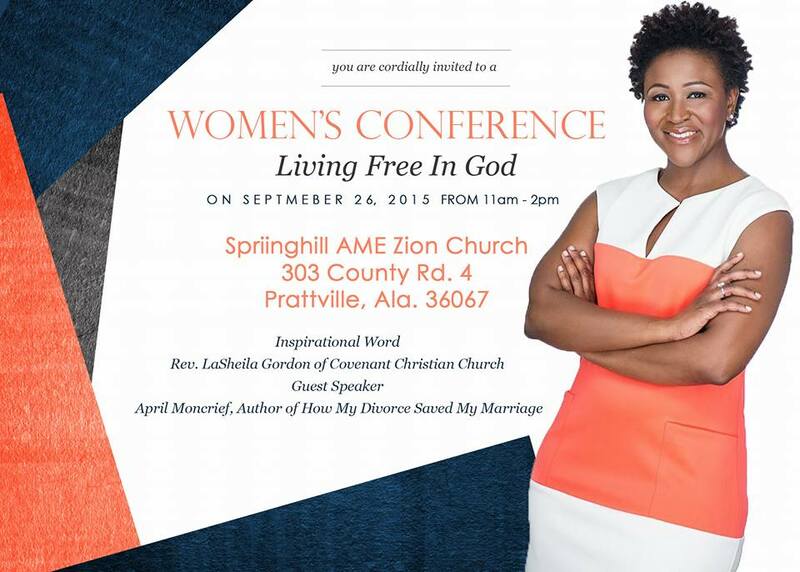 Will You Be Attending The Springhill Church Annual Women’s Conference-“Living Free In God”! I Will! The Books Have Arrived!!! Host cities, Let’s Go! Kansas! Tampa! Baltimore! Montgomery! Atlanta! Prattville! Chicago! Nashville! Kennesaw! Marietta! DC! Yall Ready!?!? They’re On Their Way!!! Let’s take these cities by storm guys! By starting the discussion most won’t have! #HMDSMM! Alright #HMDSMM Hosts!!! 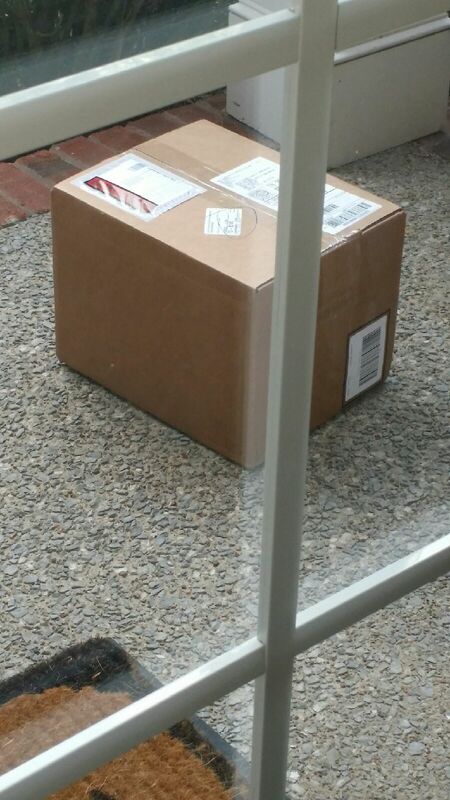 Guess what just arrived!?!? 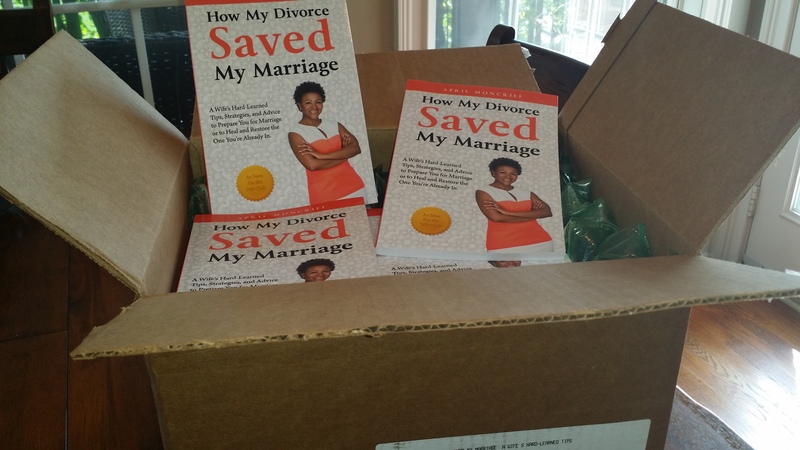 Your FREE copies of “How My Divorce Saved My Marriage”!!! I’m so Excited right now! (Just ran through the house screaming, Thank you God”!) Lol! 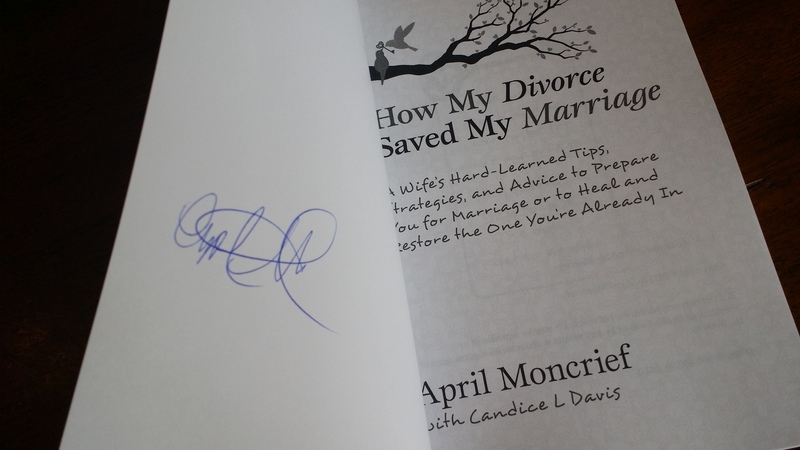 Okay, first official signed autographed copy goes to….April Thomas of Marietta, Georgia!!! Thanks for being ON IT lady as soon as I put the call out!!! You get the 1st signed copy! But don’t fret hostesses, ALL of you will be getting a signed copy of “How My Divorce Saved My Marriage” in the mail!!! Yaaay! Hopefully you all will receive your copies by this week! They go out first thing in the am! Yaaaay! Also, I hope you’ve already sent out your invites and links to Amazon to your guests so that they’re able to purchase their books! Remember, its a party and book discussion inclusive of ALL! Invite who you like but know that it can be for men, women, married, single, dating, seperated, divorced, family, friends, co-workers and even your church family/members;)! Invite them all out to what’s sure to be a very deep and personal night of discussion! Can’t wait to see those group “Selfies/Usies”!!! Lol! Thanks again everyone! Be on the lookout! #HMDSMM #BookClubDiscussion!